Millbrook Proving Ground in Bedfordshire played host to the Cenex Low Carbon Vehicle Event 2014 (LCV2014), which provided a platform for some of the industry’s most cutting-edge green and efficient technologies to be presented. Chris Peat attended the exhibition to gather details of some of the latest environmentally friendly and fuel saving equipment being developed for the market. One sight familiar to many readers would have been the York City Sightseeing Dennis Trident open topper that appeared in last week’s issue (B&CB 1293, 12 September 2014). 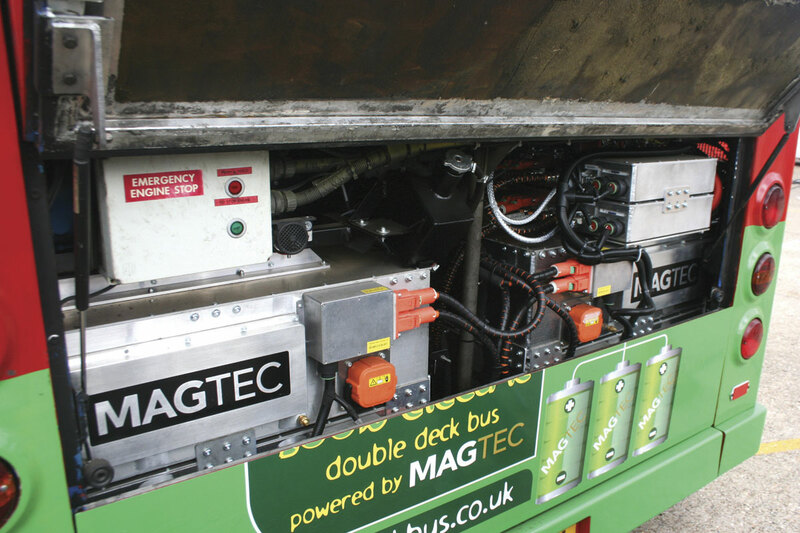 The bus has been converted from running on diesel to pure electric with lithium ion batteries by Sheffield based Magtec. International and UK delegates to the show were given the opportunity to ride on the vehicle during the event. The electric retrofitted bus is thought to eliminate up to 33 tons of CO2 and over 535kg of NOx per year and was said to reduce the vehicle’s operating cost by more than £20,000 per annum. Operated in York by Transdev under the international City Sightseeing franchise, the conversion to electric was carried out in partnership with York Council and the operator. The conversion saw its engine, fuel tank, gearbox and other components (over two tonnes worth of parts) removed. A steel frame was constructed that fits within the cavity left behind by this gutting and the electric drive system was built into it. This allowed the system to be constructed and tested outside the engine compartment. The frame is then hoisted into place and connected. None of the bus’s existing electrical equipment is removed, so it ‘doesn’t know’ there has been a conversion, according to Magtec Chairman, Marcus Jenkins. The double decker is expected to deliver 75 miles per day per charge and more batteries can be put in to extend this range. Marcus said the vehicle can be bumped up to 100miles a day, which he claims is an optimum figure. He said the vast majority of buses do no more than this mileage every day, saying tests have shown vehicles on routes inside London rarely going above this figure. It is charged over night, with Marcus claiming this means no infrastructure is required for recharges en route. Marcus said the next step is to convert more buses like the one it has launched in York. He described it as a cost effective option, especially for small to medium operators. The continuation of government grants for buying green buses should assist this. 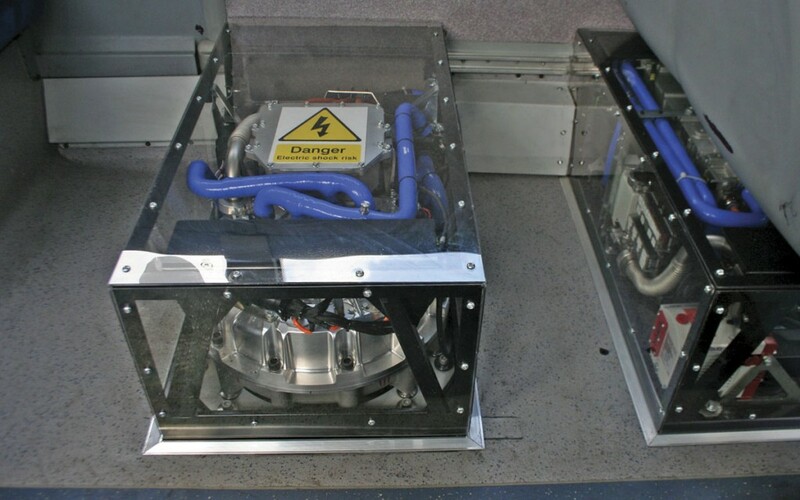 Readers may also be familiar with GKN Hybrid Power, the company behind the Gyrodrive in Oxford Buses’ new BROOKESbus fleet (see B&CB 1293, 12 September 2014). The system uses an electric flywheel, which has no physical connection to the engine or drive train. Instead, a motor/generator is fitted that harvests energy normally lost when braking, turning it into electrical power to charge the flywheel. 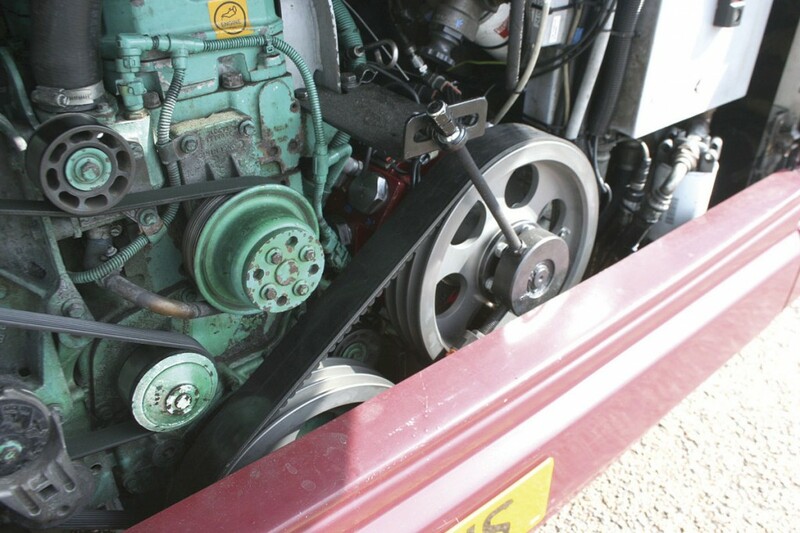 The flywheel can reverse the process, releasing the stored energy to power the engine and drive the bus. This is known as a Kinetic Energy Recovery System (KERS). GKN’s marketing material states the system is priced to provide a payback period, based on certain fuel price assumptions, of between four to six years. Millbrook has tested the equipment and demonstrated a 30% improvement in fuel efficiency. The technology was used to help power the Audi R18 e-tron Quattro to victory in the 2014 24 Hours Le Mans race. It is designed to be lighter, smaller and available with a ‘realistic payback period’ compared to a battery based hybrid system. Oxfordshire based GKN received a grant of £7.6m from the government and automotive industry towards the £15.6m project. The system was displayed onboard a Wrightbus double decker during the event. Go-Ahead has not only ordered Gyrodrive for its Oxford Buses network, it has requested the roll out of 500 units in its fleet over the next two years. Next to the Wrightbus decker containing the GKN system was a Lothian Buses Euro3 Dart featuring Artemis’s Parallel-hybrid bus transmission. What makes this system different is the fact it uses a hydraulic Digital Displacement system to capture braking energy and then re-use it to help the engine burn less fuel. The KERS uses a rubber bladder to store nitrogen pressure created through capturing energy when slowing, which is then released to power the engine. One of the advantages of this method is it makes for a very power dense system. It is a joint project between Artemis Intelligent Power, ADL and Lothian Buses and has received support from the Technology Strategy Board. The retrofit variant has been designed around Euro3 vehicles, whilst the OEM version is being designed for Euro6. Elsewhere on the hard standing in the vehicle display area was a Wrightbus StreetLite, which featured Torotrak’s Flywheel Hybrid KERS. 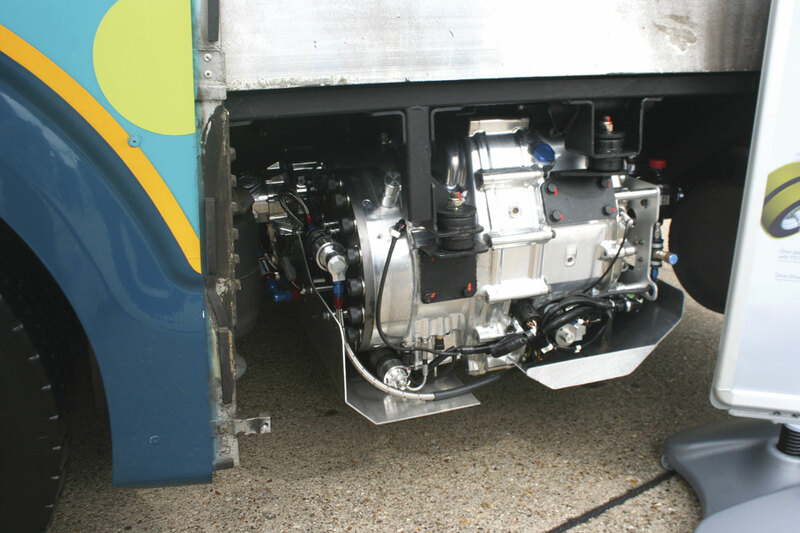 The system uses a high speed flywheel to capture kinetic energy and decelerate the bus. This energy is then transferred mechanically back to the wheels and used to accelerate the vehicle, creating fuel savings. The unit is fitted parallel to the transmission on the driveline and is linked to the rear axle by means of an additional prop shaft. To look at, there is nothing to show the vehicle has the equipment fitted, but it requires significant engineering and software integration. 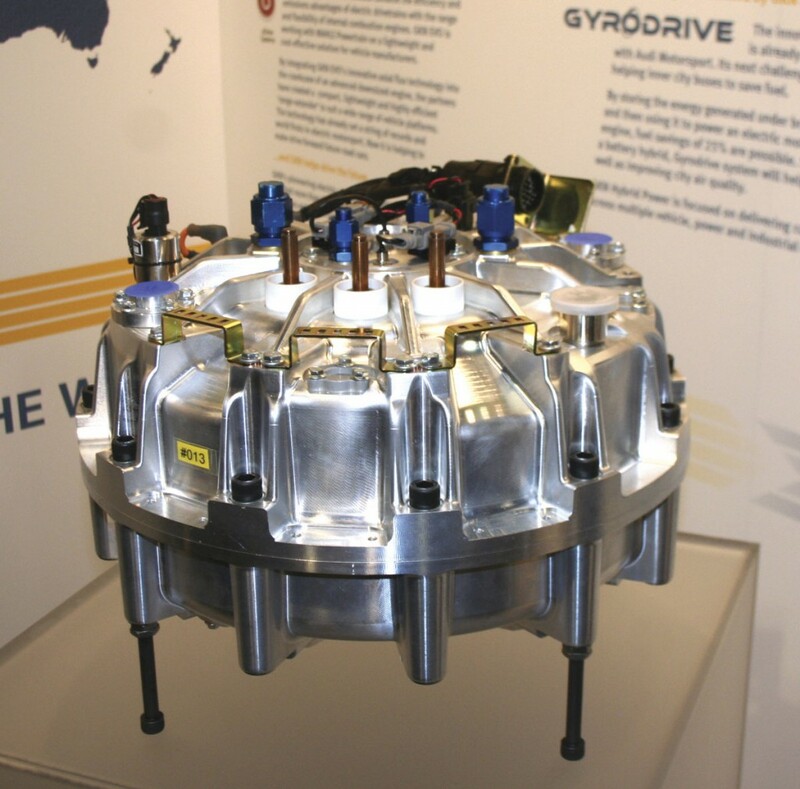 The Flywheel Hybrid KERS project was part funded by Innovate UK, the new name for the Technology Strategy Board. It was developed by the partnership of Wrightbus, Arriva, technology development specialist Productiv, Voith and Flybrid Automotive, the latter having recently been taken over by Torotrak. A 15% fuel reduction was aimed for with this project, with a payback period of five years. Retrofitting Euro5 vehicles with the equipment will be the first example of their roll out, with 25 of the systems being fitted to a range of vehicles next year. Full production is expected to start towards the end of 2015. Products Development and Sales Director at Torotrak, Jon Hilton, said this technology should enable operators to purchase electric vehicles without subsidy. He claimed something that hinders the further roll out of electric hybrids is the cost of the exotic materials they contain, which has not fallen as expected. The flywheel system has no components made from exotic materials and all its carbon fibre pieces are made in-house, helping keep costs down. Torotrak has the capacity to build 6,000 of these systems a year, according to Jon Hilton, which he claimed is more than sufficient. The company is also looking to introduce a continuously variable transmission, which has been proven to achieve 20% fuel savings. These savings are in addition to a KERS. Range extenders for electric motors were much in evidence at the event. Speaking to some of the companies that provide this equipment, the technology has not been widely installed on electric powered PCVs but many say they would be keen to do so. With a growing number of electric buses on the roads, there is a good chance this technology could be rolled out. One company that would be keen to enter the bus and coach market with its range extender was Advanced Innovative Engineering (AIE). The size and weight of these devices are key, explained AIE MD, Nathan Bailey, which is why the company’s Compound Rotary Engine for a range extender in electric vehicles is designed to be compact and lightweight. APT Controls may not be a familiar name, but its eVolt brand will be to anyone that has researched electric bus charging. The company provides the charging infrastructure for Optare electric vehicles. It has previously rolled out equipment for Nottingham’s batch of Optare electrics and the Versas put into service on York’s newest park and ride site. Its rapid charger is the ideal unit from its range to charge buses. Rolec, another electric vehicle charging company, was present too. Representatives from the business were there to make participants aware of its offerings. 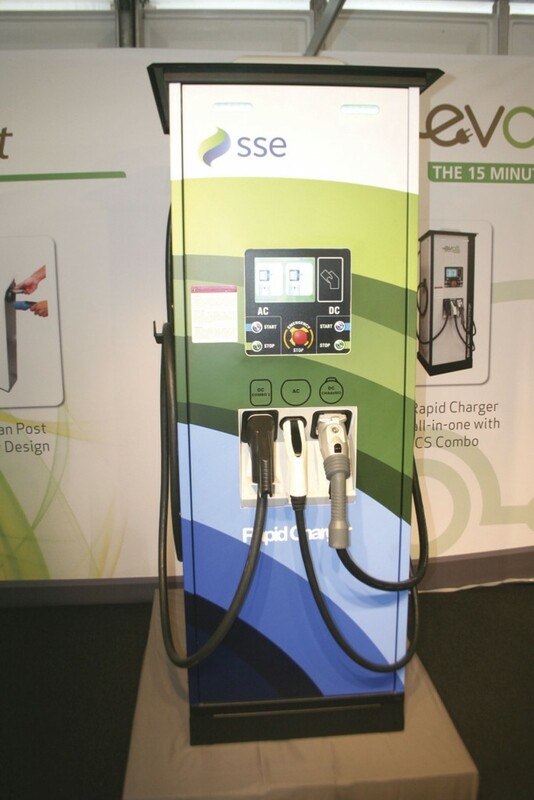 Sales Executive, Philip Hill, said Rolec can provide bespoke electric vehicle charging solutions. Host of the event, Millbrook, displayed in its own right. The newly independent company explained its range of facilities and capabilities. It recently worked with FirstGroup to identify an accurate and repeatable track based drive cycle to improve the fuel efficiency of city buses through continuous development. The FirstGroup Millbrook Fuel Economy Test (FMFET) procedure was developed as a benchmark in order to select their suppliers of different vehicle categories for the following year. The test ground created a ‘theoretical average FirstGroup bus cycle’ by matching aspects such as stops per km, elevation change per km, idle time per hour and average speed. Cenex, a Centre of Excellence for low carbon technologies, launched its new website-based Electric Vehicle viability analysis tool at LCV2014. Cenex’s FCRT lite (http://www.cenex.co.uk/fleet-carbon-reduction-tool/) is designed to enable fleet decision makers to accurately assess the viability of low carbon vehicles within their operations. The tool is based on duty cycles, fuel consumption and electric vehicle range as measured in the real world. By providing a realistic total cost of ownership, FCRT lite is intended to de-risk the implementation of low carbon fleet solutions. The tool presents a dashboard of economic and environmental performance by comparing an existing low carbon vehicle to the diesel equivalent. As well as an exhibition of green vehicle technologies, the Cenex Low Carbon Vehicle Event 2014 also included an awards ceremony, the LowCVP Low Carbon Champions Awards winners. They were announced on the evening of the first day of the event during a gala dinner hosted by Cenex-LCV in Milton Keynes. Master of Ceremonies for the awards evening was actor, Robert Llewellyn, perhaps best known for his role as Kryten in BBC’s Red Dwarf. The headline grabbing winner from the bus and coach industry was Reading Bus, which won the Low Carbon Vehicle Operator of the Year award for bringing its gas bus operation into service. The operator beat stiff competition from Tesco and Eddie Stobart to win the title. Judges said Reading Buses’ was a ‘particularly impressive entry’ demonstrating how the use of gas buses has brought additional benefits through reduced air pollution emissions and noise. They were also impressed by the company’s further commitments to lower the environmental impact of their day-to-day operation, including initiatives to reduce energy consumption and waste generation. Another winner from the bus and coach sector was BYD Europe BV, the European arm of the Chinese manufacturer Build Your Dreams (BYD), which won the Low Carbon Heavy Duty Vehicle Manufacturer of the Year accolade. Highly commended in this catergory was Wrightbus, sharing the spot with Iveco UK Ltd. 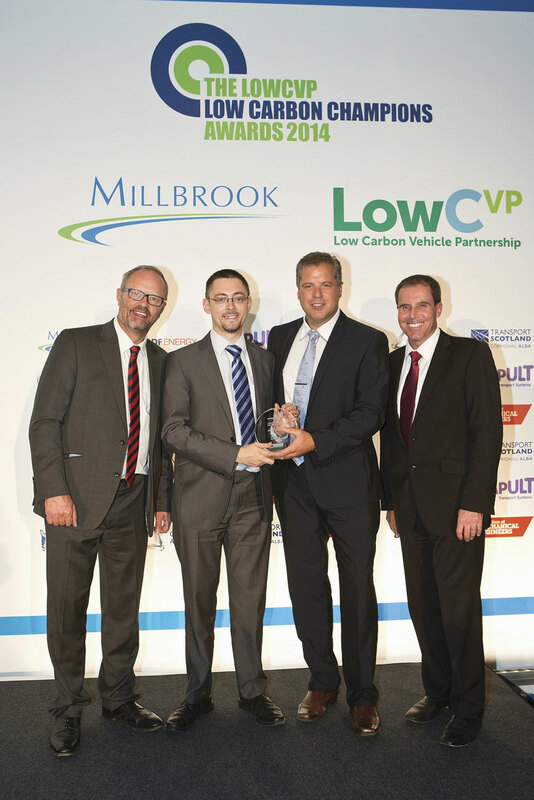 Furthermore, the Gas Bus Alliance was Highly Commended in the Low Carbon Fuel Initiative of the Year award. We are used to seeing electric vehicles, hybrids and green solutions hit the headlines in these pages on quite a regular basis, especially with the assistance of government subsidy. They are beginning to crop up in the industry in far greater numbers and one might be forgiven for thinking a revolution in vehicle propulsion is well on its way. However, a trip to the Cenex Low Carbon Vehicle Event makes it clear there is still a lot of ground to cover and innovations to make. With the likes of Reading Buses recognised in the event’s awards, the bus and coach industry is at the forefront of this drive towards a greener tomorrow.